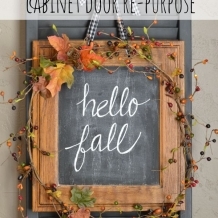 Fall decor is great because it lasts almost three months! You can put it up now and leave it up until it's time to decorate for Christmas. Plus, I may be biased but I think Fall decor is the cutest, coziest and so fun! Today we're sharing Six Budget-Friendly Ways to Decorate for Fall! 1. Transform your Dollar Store pumpkins with this easy hack and a couple cans of spray paint for a chic metallic look or go the rustic path with this crackle hack! 2. Apple lovers rejoice, this tutorial is cheap, easy and adorable! All you need is apples and tea candles for this Fall decor. 3. We love garland! On the mantle, on your table, on a banister, wherever you can find places for it! This DIY Fall Leaf Garland will be adorable in your home all Fall long. 4. Wreaths are one of our favorites and this DIY Pinecone Wreath is no exception! You could even leave this cutie up in winter! 5. Want to get your kids in on the fun? Have them collect sticks in the yard and use them to make this Twig Letter - easy, cute and you'll have fewer sticks in your yard.